Is it time to spice up your martinis? 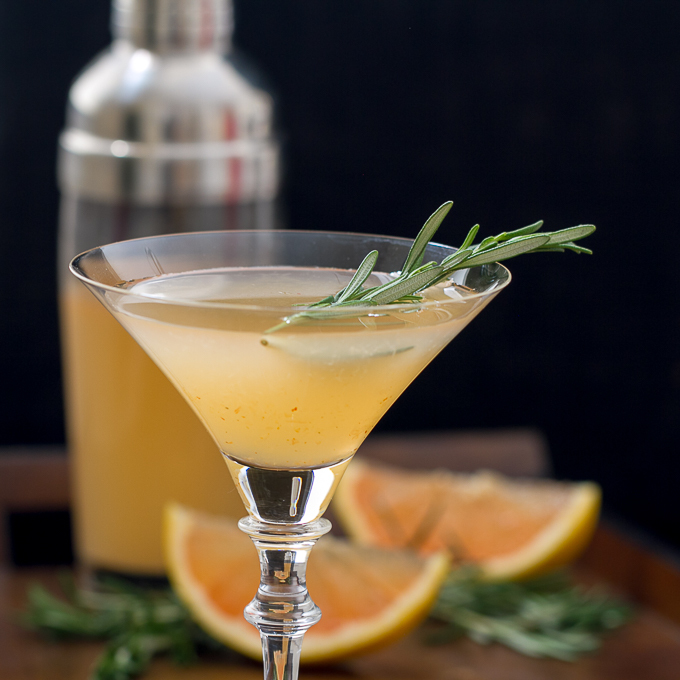 Here’s a Spicy Rosemary Grapefruit Martini that’s a bit herbal to start with a little spicy finish. I think you’ll like it! A fellow blogger friend, Amanda from A Cookie Named Desire, recently posted a recipe for some grapefruit popsicles spiced up with chili peppers and rosemary that looked and sounded fantastic! Naturally, my mind immediately thought “hummmm, that would make a really good martini!” After all, I love my Grapefruit St-Germain Martini with a rosemary simple syrup in it, so I was certain a little spice would be good too! I first made a simple syrup with 1/2 tsp. red pepper flakes (Amanda’s recipe called for 1/2 tsp. ground chile peppers) and 1 tsp. dried rosemary. I thought the red pepper flakes were just a bit too over powering in my martini. Next I tried a simple syrup with fresh rosemary and half a jalapeño. I liked the rosemary but the jalapeño wasn’t enough spice. Perhaps a whole jalapeño would have been better…or keeping the seeds with it. In any event I made a third simple syrup with fresh rosemary and a little less dried red pepper flakes and it was just what I wanted. If you don’t have fresh rosemary, by all means use dried! Now, here’s another caveat with this recipe. You can use regular vodka and some fresh squeezed red grapefruit juice, or, you can use a grapefruit flavored vodka. I tried it with plain vodka and grapefruit vodka and preferred it with both the juice and grapefruit vodka. I used Deep Eddy Ruby Red Grapefruit Vodka. It tastes fresh and natural, not artificial and it’s my favorite. 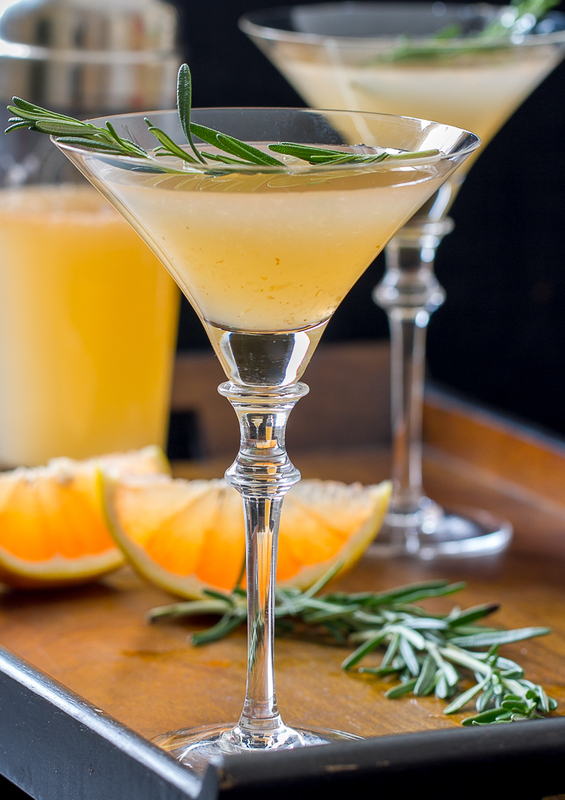 Give this Spicy Rosemary Grapefruit Martini a try next time. It’s a delicious flavor combination! Make simple syrup by combining simple syrup ingredients in small sauce pan and bring to boil. Continue to boil a couple minutes, then remove from heat and let cool. Strain and chill. In cocktail shaker filled with ice combine vodka, grapefruit juice and simple syrup. Shake well and strain into chilled martini glass. Garnish with sprig of rosemary or slice of grapefruit, if desired. This. Is. Amazing!! It looks amazing and obviously I think the flavor combo is pure genius 😉 A cocktail is perfect. I never would think to make it into a drink. I wonder if I can melt one of my popsicles and add in some grapefruit vodka. Melt one of those pops and let me know how it tastes! Another gorgeous martini Judy! Grapefruit and rosemary is a genius combination. I’ve got to give this a try. Thanks Linda… It’s different, I think you’ll like it! Fantastic. I love working with infused simple syrups! I would love it if you would link up to Tipsy Tuesday at Grey is the New Black. This drink looks delicious! I especially like the garnish. The chili infused simple syrup also sounds great. I’ll have to give it a shot.